A number of years ago I wanted to create a stone glitter house for our niece Emily and her husband Phil since they had just moved into a new stone home. I hand painted the stones on the house here and there to give the illusion of stone. I then went back and shaded the stones and added different colors here and there. It took me a lot of time but the house turned out beautiful and they were happy with it. This was also my pre glass glitter days – meaning I used regular glitter that isn’t quite as shiny. I started thinking about it and how I could do it easier by using these two stencils. The one is a Tim Holtz crocodile stencil and the other stencil is a vinyl scale stencil used for face painting. 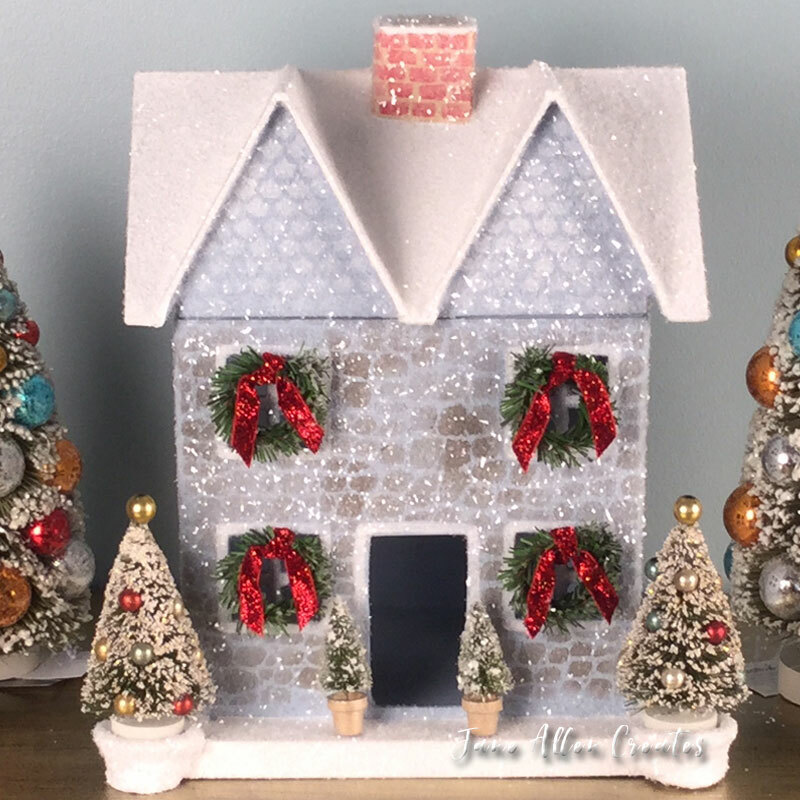 To make the grey stone house I started with a large paper maché house from Hobby Lobby. I base coated the house Winter Blue and the roof Snow White. I then used the Crocodile stencil and Slate Grey for the stone on the house. I trimmed one side of the stencil so that I could get closer to the bottom. The nice thing about the vinyl stencil is it is flexible and I can push it into the gables of the house to stencil on the clapboard. I used the Snow White for the clapboard. To finish it up I used a small flat brush and thinned tomato red paint to add the bricks to the chimney. I used a white Faber-Castell pen to add the trim to the doors and windows and used glass glitter on the house. I made wreaths out of roping and attached them to the house. For more details on finishing the house go to my blog post Glass Glitter Houses. I also used Quikwood to make little extensions to add the trees to the corners of the house. If you would like a tan stone house start with the mortar color (Sand) and use your choice of color(s) for the stone (Raw Sienna). On this house I painted the gables with Raw Sienna and then Stenciled the clapboard with Sand. I just saw that Tim Holtz also has brick, slate and stone stencils which I will have to try….but I do love how the crocodile stencil makes great stones. I hope you enjoy creating your own stone house. Make it a family tradition each year to create some glitter houses. Soon you will have your own village and a lot of great memories. The house is just beautiful!!! My house is Stucco, gray paint that looks lavender at times, so I may try to create one too. Your are certainly an inspiration with your beautiful Glitter Houses!! Thank you Colette, please share when you create your house. Your houses are just gorgeous! And love your creative touch and use of different stencils and embellishments for each and every house! Thank you for sharing! I just love the stone GLITTER house! They are so addicting! I have a HUGE old pie safe in my dining room…..I am setting up a “glitter house” display on top of it for Christmas with the houses you and Amy sent me and the one I made. I have a simple wood sleigh that my Dad made me years ago (very special to me) and a “collectible Mr. and Mrs Claus” that were once my Mother in Law’s that will complete the display. The “MAGIC” is happing! Love these glitter houses and the stencils to make things a lot easier. Thank you for sharing. You are welcome Lisa, I hope you enjoy making them.